Every four years the same articles appear in the Irish and British press about how Americans don't understand, don't 'get' soccer, err, "the beautiful game." They love to portray Americans, tediously, as looking for touchdowns or home-runs in soccer games. The journalists who repeat these statements from Americans do so earnestly, not seeming to realize that it's an American way of saying soccer is a big yawn. Although people here can sometimes wax lyrical about the great defense in a 0-0 game that sort of scoring pace doesn't interest a lot of Americans. However, this year those stories seem to be less common, possibly because it isn't just Americans who've been bored by this World Cup or possibly, just possibly, because they've realized that there are many Americans who do 'get' soccer. Maybe that's why on Saturday the Irish Times ran with a different variation on the 'Americans & soccer' theme: conservative Americans don't like soccer because it's somehow "unAmerican" or even "Hispanic." As evidence Davin O'Dwyer cited Glenn Beck and G. Gordon Liddy, who uttered negative remarks about soccer, although only Liddy attached his argument to anything even vaguely "Hispanic." I can't totally fault O'Dwyer, however, because I've come across similar views in the American press. In fact, last week NPR's web site published a piece that said much the same thing as O'Dwyer, basically claiming that race and ethnicity were contributing factors to Americans' failure to love the "beautiful game." The race/ethnicity argument is laughable and it's a shame that someone outside America would repeat such nonsense. You only have to watch America's sports to realize how wrong that is: black stars dominate basketball and football and baseball features many, many players from the Dominican Republic, Puerto Rico, Cuba, Venezuela, Mexico, etc. Conservatives watch those sports, root for those players as much as liberals do. There's not much of a political angle in Americans sports. Sure some Americans like soccer and some don't. I know plenty of Americans who don't like soccer. They find it boring or can't understand why anyone would watch or play a sport where the opposable thumb is an unnecessary appendage. I also know many Americans who love soccer. Political considerations have nothing to do with it: liberals and conservatives fit into both camps. Among those who love it are many who've taken to watching the English Premier League and Champions League thanks to satellite television. Mostly these are men who are sports fanatics and who had a gap in their lives for live sports at 10am on Saturdays and Sundays or mid-afternoon on weekdays. European soccer was able to fill that gap. These guys have a pretty good understanding of soccer. They're watching the World Cup pretty intensely and using the internet to source sports radio discussions or are using Facebook, Twitter, bulletin boards and chat rooms to get more information, analyses and opinions. The World Cup, like the Olympics, also attracts a lot of other American fans, people who'll watch this big festival of soccer, but who wouldn't consider themselves ardent fans of the game. Their interest will remain pretty high so long as the American team stays in the tournament. All of which brings me to the most important issue of the day: the US team's must-win game against Algeria (10am on ESPN). If you watch you'll see the faces of the American players are the faces of America, their names are not solely Hispanic, but represent all of America and the players give every appearance of being extremely proud to wear USA on their jerseys when they play. UnAmerican? I don't think so. 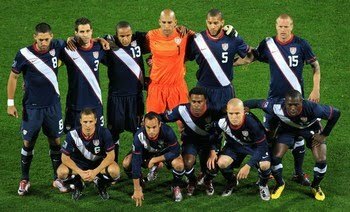 What's more, Americans take can take great pride in the team because despite being far from the most talented side at the World Cup the USA team plays with real heart, never gives up and leaves it all on the field. What more could we ask for? Go USA!